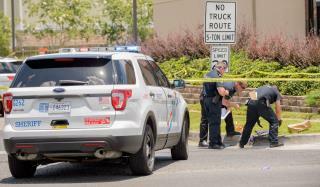 (Newser) – A pedestrian walking down a busy commercial strip of a New Orleans suburb in the middle of the afternoon shot a sheriff's deputy multiple times, killing him, after being stopped by the officer Wednesday, an official said. Col. John Fortunato, a Jefferson Parish Sheriff's spokesperson, announced the officer's death as police flooded a nearby neighborhood, searching for the suspect by helicopter and combing the area with dogs. The deputy, who was not identified, was pronounced dead after being rushed to a New Orleans hospital, the AP reports. The reason the pedestrian was stopped was not immediately available, and it was unclear what prompted the shooting. This is absolutely amazing horrible story, But that doesn't negate all of the things that happened to people of color. Shouldn't a cop who is assigned to patrol high-crime areas maybe have a partner? ?